You may be looking at this photo and thinking this dish is leftover from summer, that this was taken in mid-August when Tomatoes are supposed to be at their peak. I actually found these fabulous heirloom tomatoes in all different sizes prominently displayed at one of the busiest whole foods in the country here in NYC this week. And at summer prices. Pumpkins and apples are definitely here (though still on the expensive side) but let’s use up the best of summer before jumping into fall. I was surprised by both the simplicity and tastiness of this dish from “The Art of Good Cooking.” I added some fresh herbs like basil, parsley, and thyme both before and after baking. I then sprinkled the whole dish with fresh feta cheese and served it on slices of a toasted seeded grain bread. A healthy and light appetizer or lunch reminiscent of those dog days of summer and the colorful produce it brings. Peel onions and slice about 1/4 inch thick. Place onions in baking dish and season with salt and pepper. Drizzle a little olive oil over each slice. Cut tomatoes in slices. 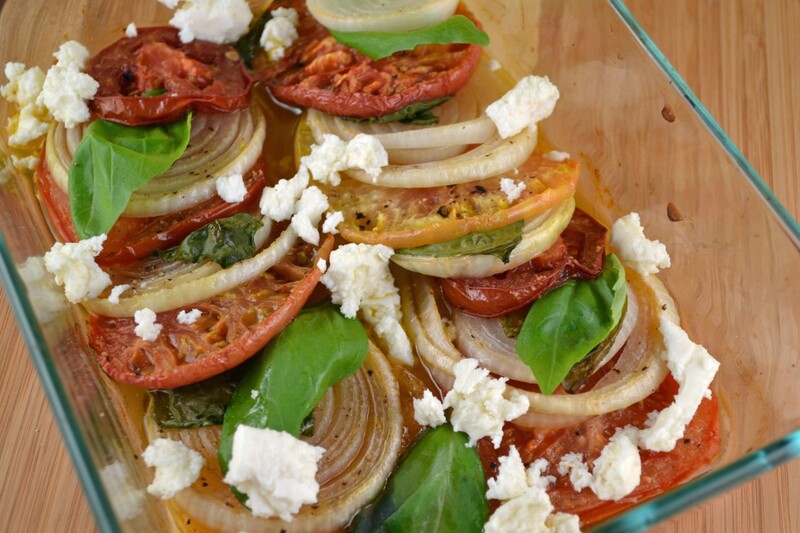 Place a slice of tomato on each slice of onion. Or, stagger slices, alternating onion and tomato. Drizzle with remaining olive oil and season with salt and pepper. Lay 4-5 basil leaves across the top or sandwich them between the tomato onion layers. Place a sprig of thyme between the 2 rows of layers. 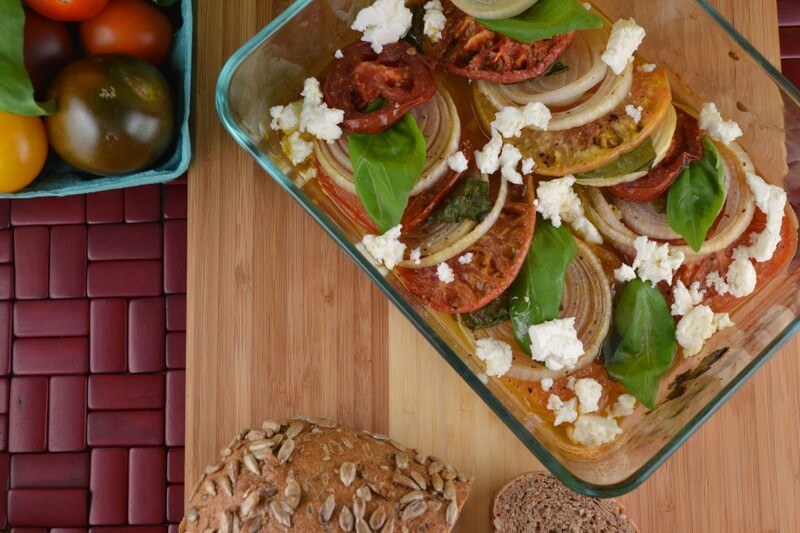 Bake about 45 minutes or until onions are tender and tomatoes are wrinkled. Baste occasionally with additional oil if needed. Remove from oven and garnish with remaining basil leaves, chopped parsley, capers (if using) and sprinkle with feta cheese. Serve warm or at room temperature on toasted slices of rustic grain or rye bread.